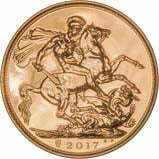 2017 was the 200th anniversary of the first modern sovereign and Benedetto Pistrucci's St George and the Dragon design. The uncirculated sovereigns feature a privy mark and proof versions of the 2017 sovereign feature a remastered version of this design with the addition of the garter border and inscription, which appeared on the original design. 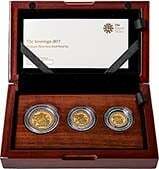 If you're looking to buy bullion, we have a dedicated page for bullion sovereigns. Gold sovereign prices fluctuate with the gold price. Track the price using our live gold price chart.